Pogba to stay at Manchester United beyond January? Manchester United midfielder Paul Pogba will not push for a move away from Old Trafford in January, Mirror Football reports. Recent reports indicated that the Frenchman will push for a move away from the club in January, with Real Madrid a preferred destination, but that will not be the case again. The World Cup winner has reportedly held talks with United boss Jose Mourinho over his transfer plans, and has agreed to suspend talks about a move until at least next summer. Despite agreeing to suspend talks, it is said that the former Juventus man will most likely try to push for a move away from Old Trafford next season. Barcelona are monitoring Pogba's situation at Old Trafford and could move for the midfielder next summer. Real Madrid are also interested in the midfielder, while Juventus have been linked with a return for Pogba. 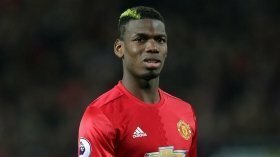 Pogba re-signed for United in 2016, but it is looking increasing likely that the Frenchman will not be an Old Trafford player for many years to come.